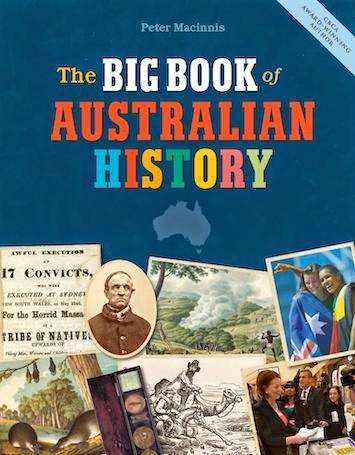 The Big Book of Australian History was written by Peter Macinnis, and published by National Library of Australia (2013). I know enough of Peter Macinnis to sit up and take notice when a new book of his is published! You may recall my review of Australian Backyard Naturalist. This meticulous researcher and entertaining writer has managed to produce yet another book that’s been selected as a notable book in the Children's Book Council of Australia Book of the Year Awards. At first, I decided to enjoy The Big Book of Australian History by dipping into it at random, but that didn’t work. Before I knew it, I was caught up in the text, poring over the cleverly and carefully chosen illustrations, and pondering the points made. As I read, I also found within myself a dawning understanding of Australia’s geological significance, a heightened appreciation of Indigenous people’s struggles, and an enhanced perspective on our Australian culture. I love the way Macinnis gives us an overview of Australian history without sacrificing entertainment in the name of research. He has an ability to dive down rabbit holes and find quirky stories and facts that will delight young readers. Did you know the nickname for Australian megafauna, Bullockornis planei, is the Demon Duck of Doom? Or that Rupert Murdoch’s nickname was ‘the dirty digger’? I also love that I found mention of some of my Australian heroes in the book. Sporting heroes are mentioned, yes, but we also meet Nobel prize winners, scientists and many entertainers - how satisfying to see Gurrumul listed as a Popular Star! Macinnis’ trademark sense of humour is also evident at times - one of the subheadings in the chapter, Voyages of Discovery, is 'James Cook takes a look'. Macinnis has an easy, conversational style that explains to children without patronising, sharing snippets from the lives of famous and not-so-famous Australians. Kids will be fascinated to discover the background to many controversial issues and how change came about often because of TV - Australians could actually “see” injustices for themselves. I believe The Big Book of Australian History is a must for libraries and homes where knowledge is prized, and people seek to add to their understanding of Australia and its people. Thanks for those kind words. FYI, there is a new revised version coming soon, with tweaks and updates. Just so long as the tweaks do NOT remove my Demon Duck of Doom!